I just love dolls and handmade crafts of all sorts, shapes, and types. I love creating, designing, and decorating with my doll & craft creations. 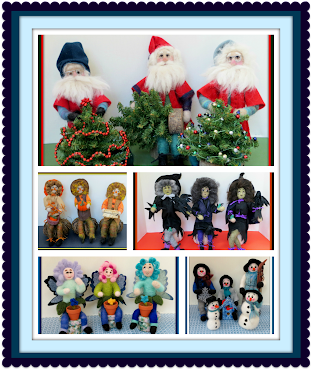 My Linda's Blog is about my handmade dolls, handmade crafts and everything I love to do. I also love to do research so there might be a little of that thrown in from time to time. 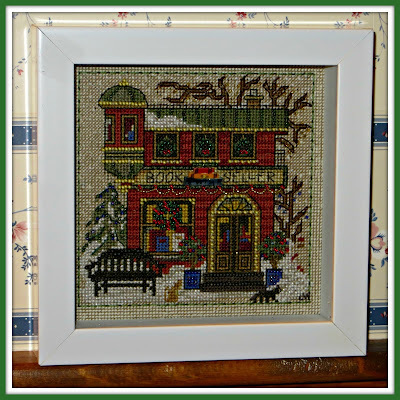 Of all the cross-stitch pictures I have done I don't have a lot of winter seasonal pictures. I wanted to change that for my winter season decorations on my fireplace mantels. So, when I saw the Book Seller Mill Hill #MH14-2305 cross-stitch I knew I would buy it. Not only does it suit my winter home decorating needs but it's about books and a bookstore, which I also love. 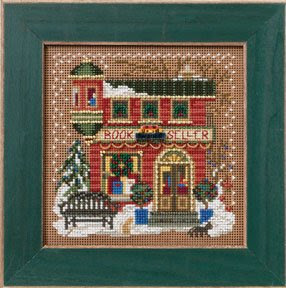 The Book Seller Mill Hill #MH14-2305 pattern uses full cross-stitch and straight stitch highlighting as well as beads of various sizes for emphasis and depth. The Mill Hill patterns usually call for certain areas of the perforated paper to be left untouched like the background or border. In this case they were leaving sections of the brown perforated paper border untouched. In embroidering the cross-stitch I decided to once again utilize the rectangular wood frame jig that my darling husband built for me that I could tape the edges of my perforated paper to. The wood frame jig is a rectangular embroidery hoop of sorts, but without bending the perforated paper. He had made it out of 1/2" x 1" pine wood strips with an adjustable center strip that I used for this 5.25 x 5.25 square design. I had learned from previous mistakes that I needed to draw diagonal lines to locate the exact center of the perforated paper as in previous perforated paper cross-stitch picture I have done the picture was slightly off center by a few holes which caused a problem with inserting the needles in the holes along one of the edges of my frame. So, I lightly drew a diagonal line across each corner with a pencil to get the center point of the perforated paper. A lot of the cross-stitch 5.25" by 5.25" pictures I have made were finished in small 6 1/2" by 6 1/2" shadowbox frames with 5" by 5" openings that I had gotten at Michaels when they went on sale one year. I used up all the shadowbox frames I had gotten previously and have been looking for them ever since and hadn't been able to find that size again. I did, however, find some 7" x 7" by 1 1/2" shadow box frames with a 5 1/2" x 5 1/2" opening at Michaels last year and bought a few white ones and black ones when they were on sale. I was hoping to use one of the white ones with this project. The directions did not include any instruction for finishing the back. I decided to finish mine with thin adhesive press-board paper. I used an 8" by 10" Pres-On sheet that I cut 6" by 6"with kitchen scissors to fit my picture. The shadow box came with a padded velvet sheet glued to the rigid back of the shadow box frame which was about 1/4" thick. My cross-stitch picture glued to the thin adhesive press-board paper was about 1/8" thick so I knew this would be a good fit once I removed the black velvet padding fabric that had been glued to the rigid back of the shadowbox. After adhering my cross-stitch picture to the 6" by 6" thin adhesive press-board paper I inserted it into the back of the frame and then inserted the 6" by 6" rigid back that came with the frame over it. The shadow box frame came with 8 metal clips to hold the rigid back inside the frame which I secured. The press-board fit perfectly and was the right depth for the shadow box frame. I don't like seeing the perforated sections of the paper within the picture and for the border as I think it makes the cross-stitch picture look unfinished and opted instead to finish the inside of the picture and border with ecru colored DMC embroidery floss sewn as a half cross-stitch using 2 strands of the floss. I also decided to add a border line around the picture for emphasis using 2 strands of the green floss sewn in a back stitch. 1) The pattern did not call for certain sides of some of the windows to be outlined. I opted to outline all sides of all the windows (inside and outside) instead using two strands of the green floss. 2) The pattern did not call for any outlining around the house or Victorian dormer. I opted to back-stitch outline around all sides of the house and Victorian dormer using two strands of the dark green floss. 3) The pattern did not call for any outlining on the book seller sign. I opted to use two strands of the green floss and back-stitch outline along all of the inside and outside of the sign. 4) The pattern did not call for any outlining on book seller sign. I opted to use two strands of the brown floss and back-stitch outlined along all sides of the tree and branches. 5) The pattern did not call for any of the roof's to be outlined. I opted to outline all the roof's instead using two strands of the green floss. 6) The pattern did not call for any outlining definition around the bark trees and branches. I thought they needed more emphasis so I opted to use two strands of the brown floss and back-stitch outlined the sides of all the bark trees and branches. 7) The pattern did not call for any outlining definition around the evergreen tree. I thought the evergreen tree needed more emphasis so I opted to use two strands of the green floss and back-stitch outlined several sections of the evergreen tree branches. 8) The pattern did not call for any outlining definition around decorative tree containers. I opted to use two strands of the blue floss and back-stitch outlined around the containers. The cross-stitch chart was in black and white as was the floss color code and symbol key. Both were easy to read and very clear. While I had no problem with the chart and keys I did have a problem with the way the DMC floss was presented. All of the floss was tied together in one big knot so you had to separate the floss pieces yourself, sort them, and try to interpret which color belonged to which floss # and symbol key on the color chart. If you only have a few colors to deal with this isn't a problem. However, if you have several different colors to choose from that are close in color then interpreting the chart can be tricky. You may assign the wrong color to the wrong symbol if the colors are too closely aligned. The key code chart should have contained the number of strands that were included in the kit so I would know how many strands I had for the different floss colors. As I have done with other cross-stitch kits I've completed I had to design my own thread color sorter and symbol key. I took a piece of thin cardboard and cut a 1" x 9" long rectangular piece out to use as a thread sorter. I then punched holes in my cardboard strip in which to tie each of the different colors. Just above the hole I wrote the DMC floss # and just below the hole I added the respective cross-stitch symbol. I then inserted the floss threads that went with that # and symbol through the hole and tied them in a loose knot. This kit could be much improved if a thread sorter with respective #'s and symbols was provided. The beads were contained within three small ziploc bags which was fine. The chart had footnote symbols to help distinguish which beads were within which bag. Despite the relatively small issues I had encountered with the kit I was happy with the way my "Book Seller" cross-stitch picture turned out. 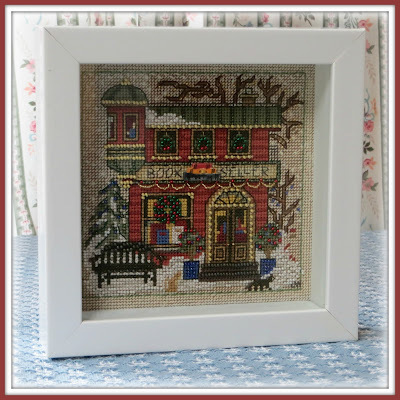 As always, my comments are meant to be constructive to enable future purchasers to benefit from my experience and to enhance their ability to create a wonderful little cross-stitch design. I have written a LOT of stories since 2004 about my handmade gifts, my family and my childhood. So much so that at last count I was close to 250. YIKES!! That's a lot of stories. But, with a big family there's a lot of gifts and a lot of "stories" to tell. Of course you have to keep in mind that these are "stories" and as such there may be a little exaggeration going on here or there. They are stories after all. So, I decided to create a separate FAMILY label just to keep track of my stories. Just click here or click the FAMILY label in the categories box of my sidebar, Enjoy! If you love doll histories you'll love my free "Gotta Love Doll Histories" free e-books HERE. 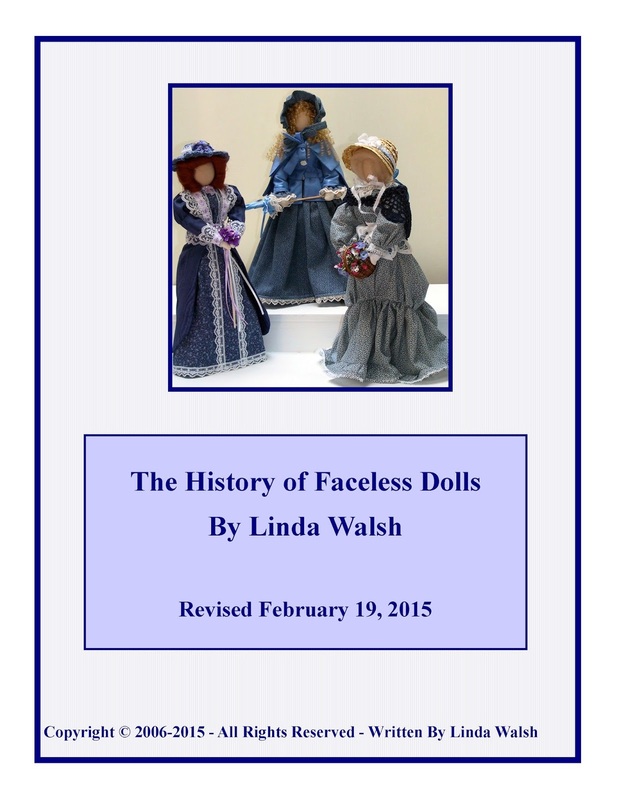 I created a History Of Faceless Dolls .PDF. 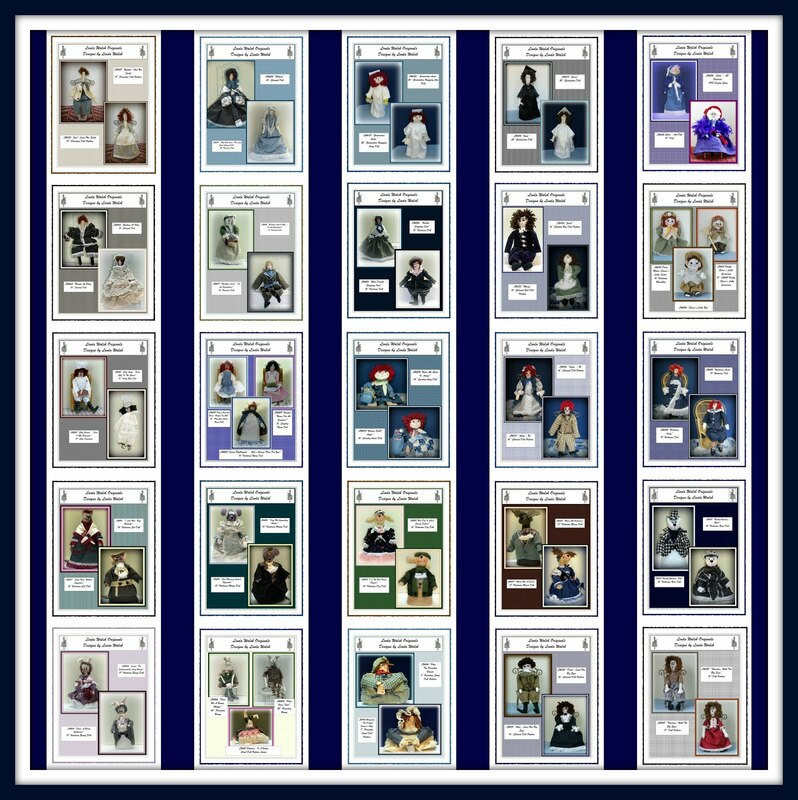 If you would like to download my History Of Faceless Dolls .PDF please click here or on the picture above. I think you all know that I, personally, love faceless dolls. 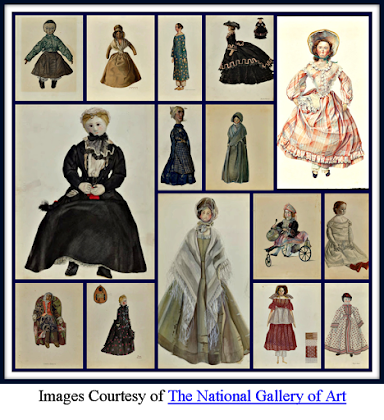 Victorians, primitives, colonial, prairie dolls, rag dolls, or country style dolls. It doesn't matter. I love them all. In fact, I created a video to reflect my feelings about faceless dolls which is: "Beauty lies not only in what is seen, but what is imagined. I believe the essence of a dolls faceless beauty should determine her personality." Please CLICK HERE or on the video below if you would like to view my "Linda's Faceless Beauties" video. Ask My Grandson! He'll Tell You! I'm An Independent Pattern Designer - Where Can I Sell My E-Patterns? Would you like to read more about me? If so please click on the screenshot above or CLICK HERE! 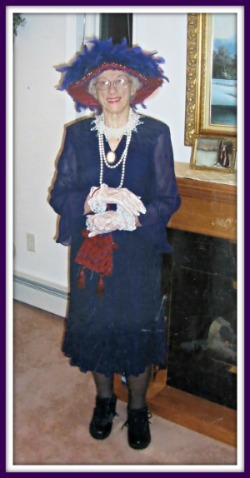 I hope you get a chance to visit my Victorian blog. You're gonna LOVE the dresses! I just love books and craft kits. For the books I especially like books on crafts, craft making, dolls, doll making, sewing, handmade items, floral design, and history. I have a lot of doll and crafts books that I have bought over the years and I'm going to tell you about the ones I have. I'll be providing book reviews of the ones I like and tell you why I like them. 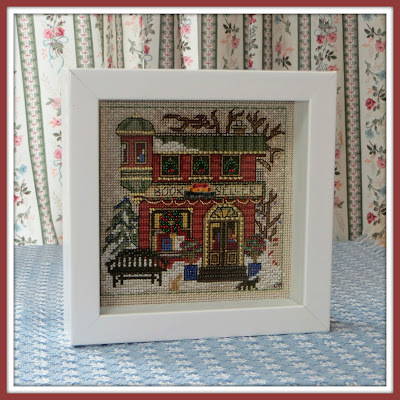 I also LOVE craft kits - especially punchneedle, wool felting, and cross-stitch. So, I thought I'd tell you which kits I've bought over the years and show you the results when I've completed them. Plus, I might surprise you from time to time and throw in a few other things along the way. So, grab a cup of tea and stay for awhile. Want To Know Why My E-Patterns Are So Wonderful? 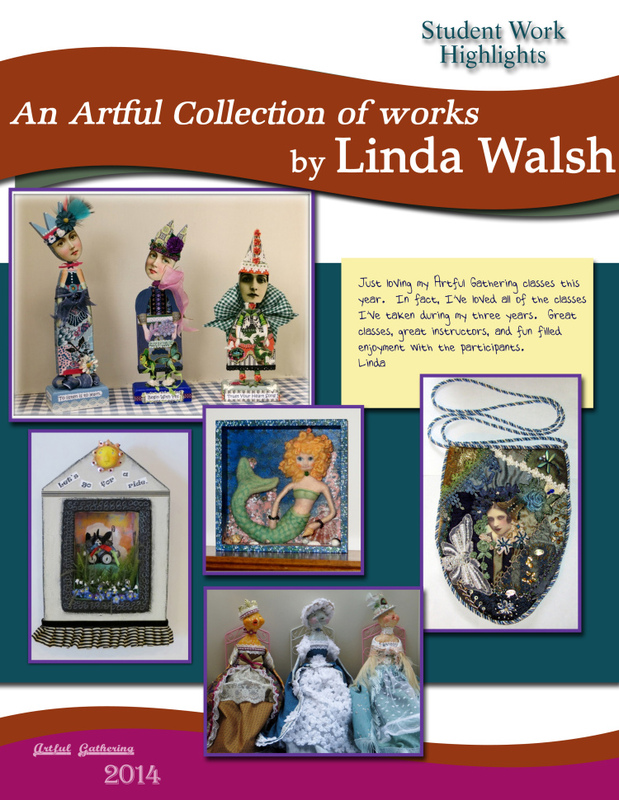 If you'd like to know what sets Linda Walsh Originals E-Patterns apart from other e-patterns just CLICK HERE. Happy Sewing. 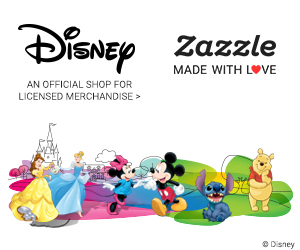 I hope you get a chance to visit my wonderful Lijnda Walsh Originals Designs, Alpacas Rock, Gray Is Beautiful, It's Raining Baby Showers and It's Raining Doll Parties Zazzle Gallery Stores. Just CLICK HERE. I Have A Love Affair Going With Blinkies! If you'd like to read about my sister's latest adventure into alpaca farming please CLICK HERE. If you'd like to read about my sister's alpaca fiber please CLICK HERE. If you'd like to visit her website please CLICK HERE. "Self-portrait icon made by the Abi-Station"
"The following 4 icons were made by Abi-Station"
"Linda at work at Linda Walsh Originals." "Linda and her little sister." 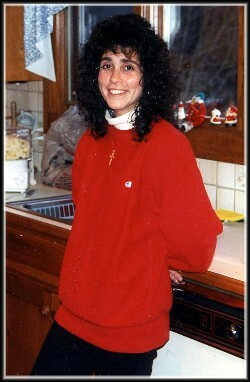 "Linda getting ready to conquer the world!" It comes from the love in my dog's eyes. And knew you were in pain. You would not be well again. He knew what was to be . But know you weren't alone. Is Fall Your Creative Season, Too! 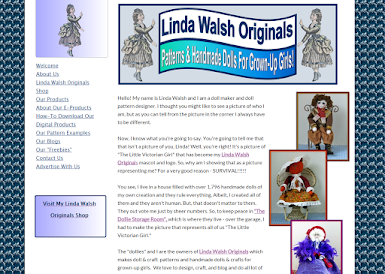 Copyright Terms For Linda Walsh Originals Website(s)/Blog(s) Articles, Patterns, E-Patterns, Printables, E-Printables, E-Books, Graphics, Fabric Designs and E-Products - © 2004-2019 Linda Walsh Originals-Designs by Linda Walsh. All rights reserved. 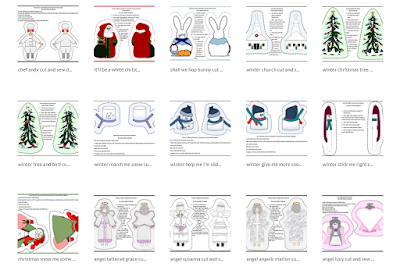 Patterns, e-patterns, printables, e-printables, e-books, graphics, tutorials, how-to's, articles and other e-products are for personal use only. You may not modify, photocopy, download, upload, post, transmit, display, perform, publish, license, reprint, create derivative works from, mass duplicate, re-sell, digitize, and reproduce in any other form (print, digital or electric) or commercially apply, embed, share, Email, or redistribution in any other means. Use of any of the above is prohibited without the written permission of Linda Walsh. However, you may link to my website(s)/blog(s) and the individual page(s)/blog post(s) (including 1 picture) but do not copy, reprint or duplicate my website(s)/blog(s) or individual page(s)/post(s) without my permission. Thanks For Stopping By! I Hope You Had A Wonderful Visit. Copyright © 2005-2019- All Rights Reserved - Linda Walsh Originals - Linda Walsh Designer. Picture Window theme. Powered by Blogger.